Jewel B.M. Love EAST MONTPELIER — Jewel Beeber Mandelbaum Love, Sept. 3, 1935 - April 12, 2019. 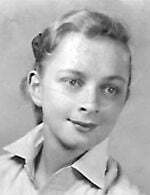 Jewel attended Goddard College in Plainfield in the 1950s and looked back on those years as some of her happiest. She is survived by two sisters, three children and two grandchildren. Her kin wish to extend their deepest appreciation and thanks to all members of the Vermont community who tried to help her troubled spirit through the years. She is at peace now. A graveside service will be held in Green Mount Cemetery in Montpelier today, Wednesday, April 17, 2019, at 1 p.m. Arrangements are by Boucher and Pritchard Funeral Directors. Much love to you, Julie, and to all who have experienced your journey.